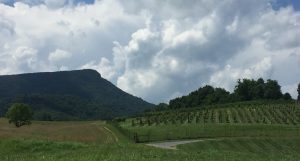 One of the smallest, and most obscure new Virginia wineries is Jump Mountain Vineyard, which opened in 2012 some 15 miles north of Lexington. Although it’s not far from the intersection of interstates 64 and 81, Rt. 39 and the Valley Route 11, it’s only open on weekends, and then by appointment, with no helpful signage from the main route Maury River Highway Rt. 39. The aptly-named Jump Mountain looms as a fine geologic landmark the closer you get to the winery, until you turn in at the gate and get a breathtaking view of the mountain looming above, with vineyards in the foreground. Owners David Vermillion and Mary Hughes purchased the 32-acre farm in 2006, planting their first vines in 2008. They chose the site for its warmth, low humidity and rainfall, well-drained soils and cool night temperatures (for malic acid retention in the grapes), with an elevation of 1330 ft. For a site in the western mountains, they raised some eyebrows by planting cabernet sauvignon, but the wisdom of site selection has validated their choice. While cabernet sauvignon dominates the volume of wine production, with two varietal labelings (2012 with 12% tannat and 2013 100% varietal), they have diversified, with a look to northeastern Italy and Austria. Their one white currently is a varietal gruener veltliner from 2015 (their 2014 has sold out), and they have a fun, fruity and dry Italian blend of refosco, lagrein, sagrantino and the two cabernets. They opened at an unfortunate time for a new vineyard in Virginia. The last three winters they’ve been whacked with the polar vortex killing young vines, and spring frosts killing the potential crop on many vines especially the cold-tender sagrantino and tannat. David confides that in 2014 their total production was less than 200 cases or around 3 barrels worth, due to crop losses to winter kill. The good news is that Mary and David haven’t given up, and have re-planted dead vines with new ones on more low-vigor-appropriate rootstock. One reason why their wines are so flavorful is that the low vigor of the site reduces berry size, with a greater phenolic/flavor compound ratio to water in the berries than with a more vigorous site. Another reason is that their site soaks up the heat in late summer, but Jump Mountain blocks the west wind, allowing a warmer south wind up their valley as far as their site. “We’re right on the [mesoclimate] frontier,” says David. At the same time, cool air flowing down from nearby Jump Mountain keeps nighttime temperatures low, retaining good malic acid levels in the grapes, where vines planted say in the lower Piedmont would lose malic acid with lower levels of diurnal variation in temperature. Right now, there are just three wines available at the winery, but Market St. Wineshop in Charlottesville carries them. I still think the trip out there is worthwhile if you’re driving between Lexington or points south or west and Charlottesville, for the views and lack of tasting room craziness (note: you have to call and make an appointment to taste the wines on the weekends, and they’re not open weekdays.) 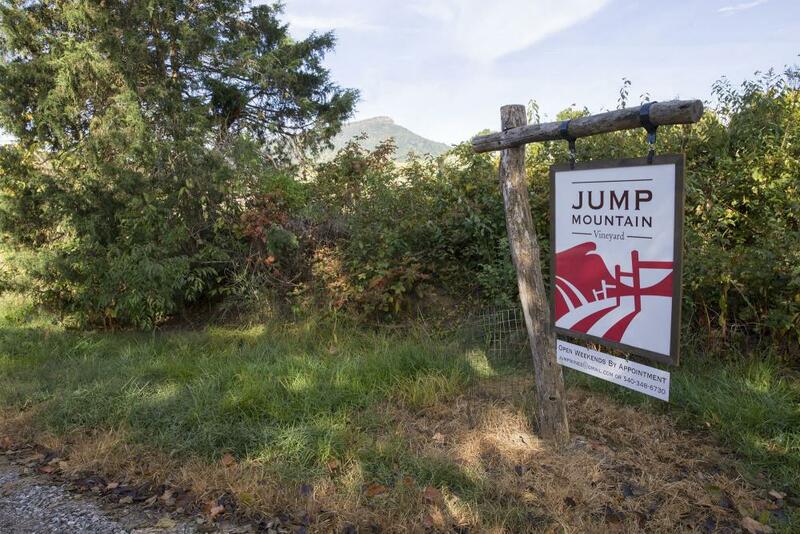 Jump Mountain has King Family Vineyards winemaker Matthieu Finot as their consultant winemaker. Gruener Veltliner 2015: aged on the lees in a used Burgundian oak barrel. Nose: definite varietally characteristic white pepper and wax bean, not fruity but aromatic. On the palate, dry, full, round but large volume, with prickly pear texture and spiciness. Young, will evolve; stylish, will be great with seafood and chicken in cream sauce. Cabernet Sauvignon 2012: (12% tannat) Nose: mature, spicy with black cassis, smokey and gamey, intriguing, like a barbera/dolcetto blend or a Rhone blend. Palate: light-bodied but zesty, dried red fruits, smooth and spicy, versatile, mature and fun. You think of other grapes than a cabernet sauvignon when tasting it, but it’s much more interesting than many of them. ♦ Cabernet Sauvignon 2013: 100% varietal. Dark opaque ruby color. Nose: solid ripe red cassis, cedar and smoke; seems classic for the grape and the vintage in Virginia. Palate: huge volume, ripe red fruits and cedar/spice, firm but ripe tannins. Young but stylish, will age well. Can drink well from this fall. Cabernet Sauvignon 2014 (will be released in October, has a bit of tannat). Color: very dark. Nose: ripe black fruits, evolving into black currants and black cherries. Palate is zesty and fresh with bright acidity and fruit-driven. Lively black fruits and firm but ripe tannins, reminiscent of a Northern Italian red or a cabernet from Southeast Seneca Lake (the Finger Lakes). Young but will drink well in 18 months and hold for a decade; only 82 cases made. Italian Blend Yet to be Named, 2015: Includes refosco, lagrein, sagrantino and the two cabernets. This is the first vintage these grapes have been blended. Nose: fragrant ripe cherries and strawberries, and roses. Palate: firm acid, with zesty sour cherries and red apple. Very bright red fruits with lively acidity, a great warm weather red wine. Still in barrel, promising potential, original and stylish. Click here for more information on Richard. For more reviews by Brian, click here. Thomas Jefferson accomplished much in his life – author of the Declaration of Independence, third president of the United States, founder of the University of Virginia. Even our country’s love and cultivation of wine can be attributed to him. 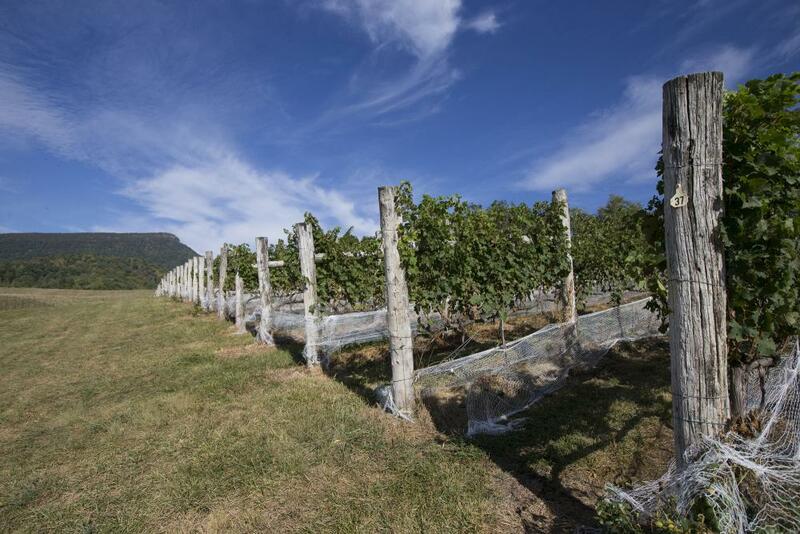 Jefferson, considered America’s first distinguished viticulturist despite his inability to grow grapes, would be pleased to know that grape and wine production has finally taken root and is flourishing in Virginia. In 1985, the Thomas Jefferson Foundation restored Jefferson’s 1807 plan for the northeast vineyard at Monticello. The southwest vineyard was replanted in 1993. Gabriele Rausse, one of the founders of the modern Virginia grape industry, oversees the production of wine and the care of the restored vineyards. He also leads workshops and teaches courses on the subject. Around 2009, U.Va.’s School of Continuing and Professional Studies offered a course on Jefferson and wine, which Rausse led. 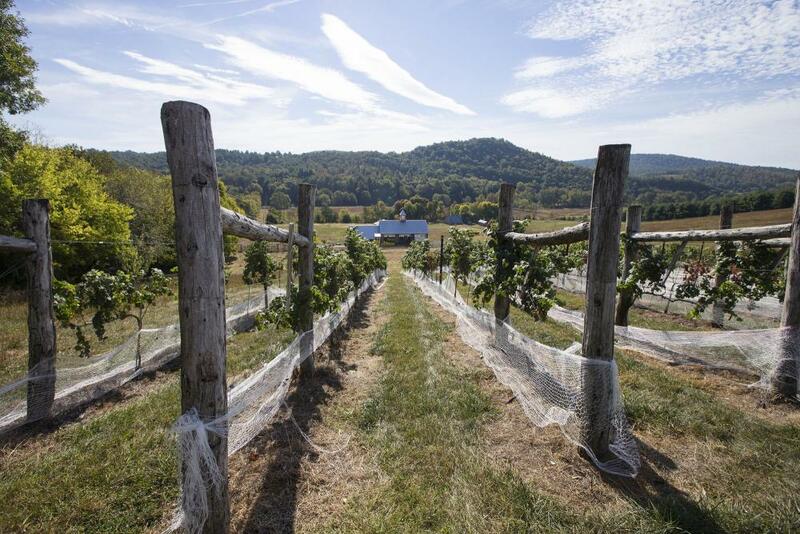 He asked Hughes, who teaches landscape architecture and historic preservation courses in U.Va.’s School of Architecture, if she would teach the session on starting a vineyard. Hughes said teaching the wine class whetted her and Vermillion’s desire to delve further into enology (the study of wine and winemaking) and viticulture (the cultivation of grapes). Fittingly, “Over a glass of wine one night, we confessed to each other our long-held, secretly repressed dream to own a vineyard,” Hughes said. The two enrolled in a then-new enology and viticulture program offered by Piedmont Virginia Community College and Workforce Services, the only one of its kind then and now in Virginia. “That was around 2004,” Hughes recalled. 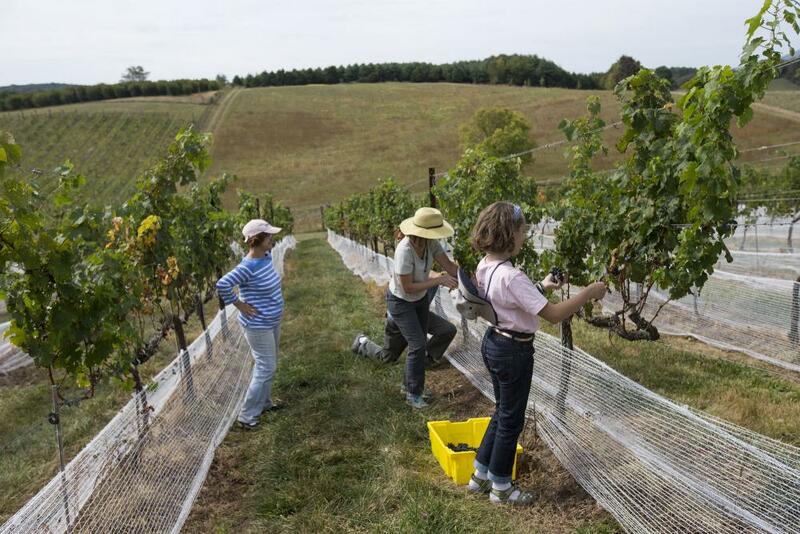 After they completed the program, they started looking for land for their vineyard, a multi-year project that took them all over Virginia and beyond. They talked to other up-and-coming vineyard owners and winemakers, some of whom are U.Va. alums. Fall is grape harvest time in Virginia. Here, the burgeoning wine industry is now home to more than 250 wineries and ranks fifth in the nation for wine grape production, compared to six Virginia wineries and 286 acres devoted to wine grape production in 1979, according to information produced in part by U.Va.’s Weldon Cooper Center for Public Service for the Virginia Department of Agriculture and Consumer Services. A 2012 economic impact study showed that Virginia wineries and vineyards support 4,800 jobs that provide $156 million in wages; and Virginia’s wine industry contributes nearly $747 million annually to Virginia’s economy. Some 1.6 million people visited Virginia wineries in 2010. Two years ago, Wine Enthusiast magazine named Virginia one of the 10 best wine travel destinations in the world. They even tinkered with the notion of buying an established vineyard in France, where the slumping wine industry has created something of a buyers’ market. So a vineyard in the south of France wasn’t to be for the U.Va. couple. In 2006, they bought a remote property in Rockbridge Baths, Virginia, just north of Lexington, that was formerly a veal operation. Soon they were spending every weekend there, tearing down the cattle barn, re-grading the land, removing weeds. 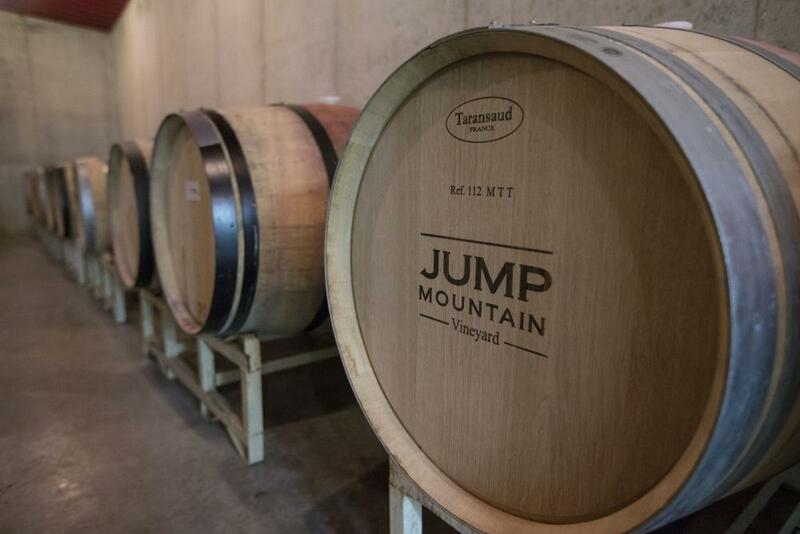 Over time, Jump Mountain Vineyard took shape. Finally it was time to plant. Jefferson may not have articulated that his Academical Village be a place to cultivate community among all its inhabitants – students, faculty and staff – but that’s been an offshoot. 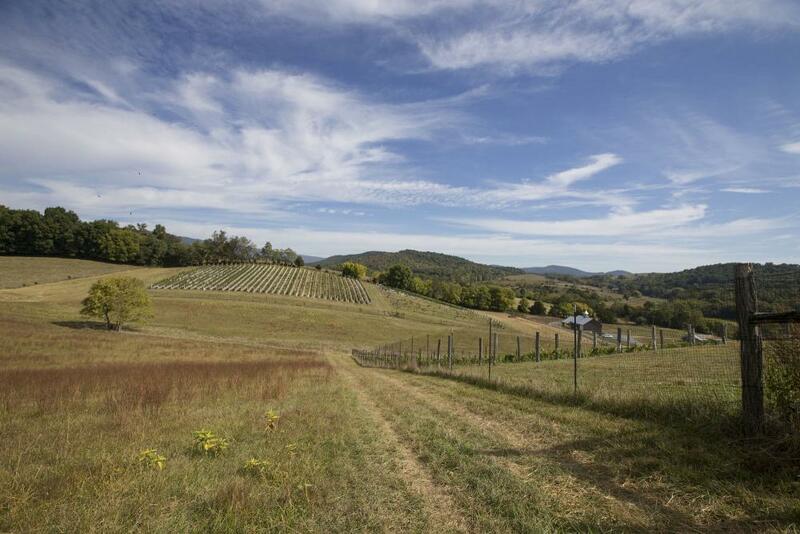 In 2008, Hughes and Vermillion planted their three-acre vineyard with help from about 50 of their U.Va. friends and family. Rausse had told them, “Pick your hottest hill and plant cab sauv. You will always sell it,” Hughes recalled. So that’s what they did one spring day seven years ago – they planted 2,000 cabernet sauvignon vines. Among the friends were Jim and Cathy Popp, Brian Hogg, Andrew Greene, Connie Warnock, Ida Lee Wootten, Kate Meyer, Sandy German, Beth Meyer, George Payne, Joey Toombs, Jody Lahendro, Julia Monteith, Rob Cordero, Susan McKinnon and the aptly named Peter Vines. It takes three years to produce grapes once the vines are planted, and five for them to “hit their stride,” Vermillion said. Cabernet sauvignon requires a “super long growing season for the grapes to fully ripen before harvest,” he said. “We have always been able to fully ripen the crop,” which he attributes to the vineyard’s “distinctive terroir,” special characteristics that the geography, geology and climate of a place, interacting with plant genetics, express in agricultural products such as wine. Like the grapes, their ambitions grew. 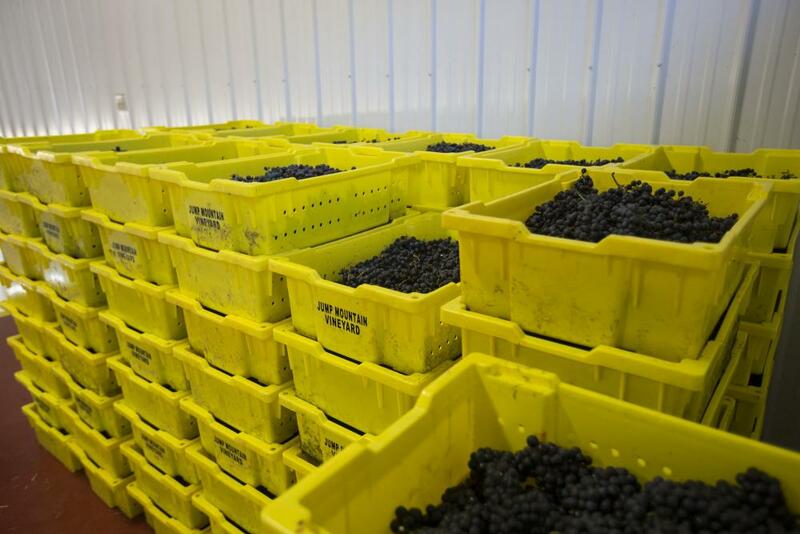 “We were only going to grow grapes initially,” Vermillion said. “But after a year, we decided to open a winery,” Hughes said, and both laughed. When word reached Hughes’ former colleague, Samuel “Pete” Anderson, who’d retired as Architect of the University several years earlier, he informed her and Vermillion that they’d need an architect to design their winery, and he was volunteering his services. The couple is pleased with the end result – a beautiful, barn-style winery set in the shadow of Jump Mountain, a local landmark and the operation’s namesake – and they’re touched that their friend designed it for them. The winery was finished in January 2012, though there are plans to add a tasting room one day. 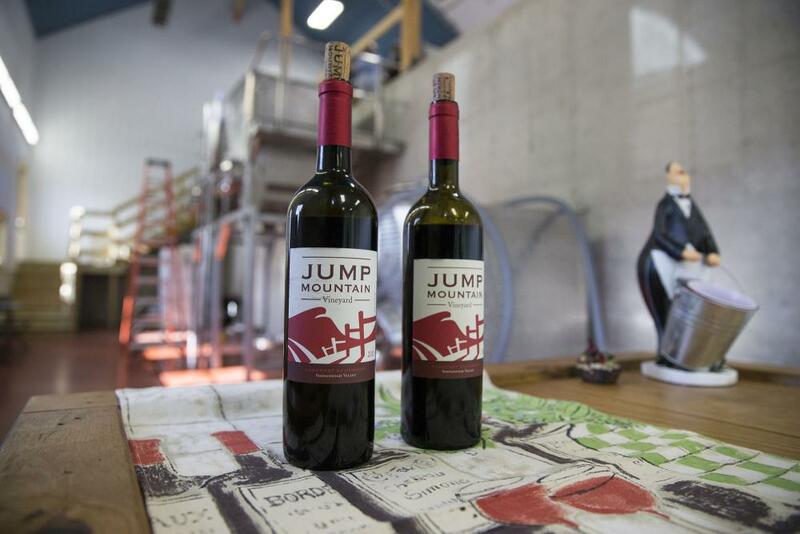 Jump Mountain produced its first wine in 2011 using another winery, Ankida Ridge in Amherst, to process the grapes and store the wine. This year’s harvest took place Sept. 27 and 28. Lending hands were U.Va. friends Warnock, assistant University architect; Hogg, senior preservation planner; and Kate Meyer, senior project manager in Facilities Management. Meyer also brought her husband, Will, and daughter, Anna. Saturday involved picking the grapes. Sunday’s task was processing the harvest, Hughes said. “The grapes are dropped into the hopper of the de-stemming machine, which pulls the berries off the stem. Then our nimble-fingered friends were manually sorting through the grapes to pull out any remaining stems, leaves, insects or imperfect berries. The remaining berries were gravity-fed into a steel tank on the floor below. When the de-stemming and sorting process was over, which took all day, I added yeast to the berries to start the alcoholic fermentation process that turns the sugar in the berries into alcohol and juice into wine. Warnock said of the experience, “If you have friends with a farm-vineyard, you will never see them socially, unless you pitch in with the work. … I leave the chemistry and the magic of wine-crafting to Mary and David. Except for the vine-tending, which takes a little skill, it’s pretty basic labor. I am now an experienced taster, however, and could probably identify each vintage in a blind taste test. … But I mostly just enjoy the sun and clouds, the birds and bugs, the mountains and the trees, and tending the vines. Sometimes we chat, but often we work in companionable silence. It is quiet, simple, almost meditative work. Meyer echoed Warnock’s reasons for pitching in. “I’m surprised that Mary and David are not beating away the volunteers. … I go and am rewarded strictly by the pleasures of being in the Virginia countryside in spring and fall, the reward of handling warm earth and sticky sweet grapes, and the conversations with colleagues slipping into meaningful friendships developing over seasons. Hughes and Vermillion said they are always in awe of their friends’ willingness to help. “We’ve been very fortunate to have the support of friends and family,” they said. That support spills over into their winemaking and grape-growing family, too. 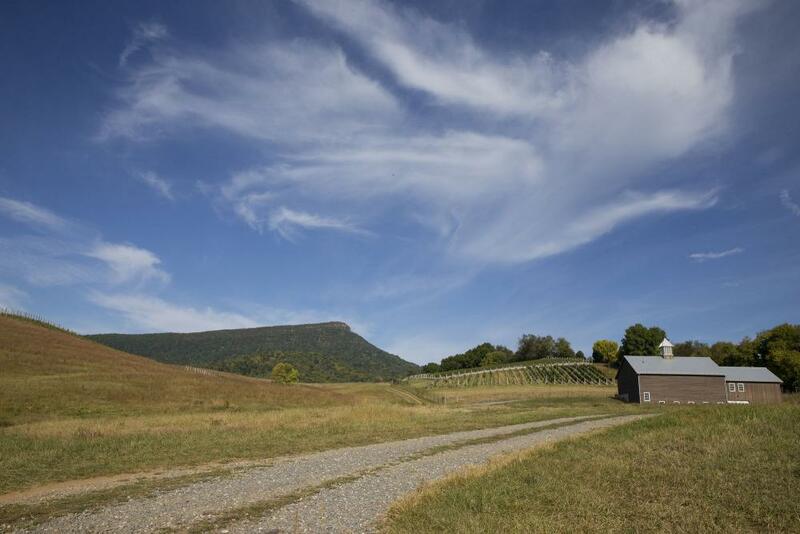 “What’s remarkable about the Virginia wine industry is how helpful and cooperative everyone is. It’s not cutthroat as one might expect. We all feel we’re part of growing something that’s in its infancy in Virginia. We’re still learning to help the next generation of winemakers and grape growers; it’s not proprietary at all. They open their hearts and share their knowledge,” Hughes said. One day, operating Jump Mountain Vineyard could consume Vermillion and Hughes’ full-time attention. But for now, it’s their avocation. Why do they choose to work at U.Va.? For a landscape architect like Hughes, it doesn’t get any better than working at the only university in the U.S. designated a UNESCO World Heritage site. Hughes earned a graduate degree from U.Va.’s Architecture School in 1987 and thought she had landed her dream job when she went to work at the National Park Service. And it was – until an intern told her about a new landscape architect job at U.Va. She placed a call to the Architect of the University, Anderson, whom she didn’t know at the time. The two hit it off, and she was hired in 1995. Vermillion was unwittingly lured back to Charlottesville by a firm in Roanoke filling IT positions for a “nearby college town,” he recalled. Coming home didn’t turn out to be a bad thing. The best part, of course, is that he met Hughes, but he also likes working with his IT colleagues, and enjoys technology and problem-solving. These interests carry over into his work at Jump Mountain. Vermillion keeps notes on the vineyard in a spreadsheet that tracks temperatures, rainfall and the like. Every year is different, so every year the optimal time to harvest – “at peak sugar, when every creature around starts to descend on the grapes because we can all smell the sugar, bears, raccoons, turkeys, birds” – is different, he said. Around harvest time, their wine consultant, Mathieu Finot, the winemaker at King Family Vineyard, reviews Vermillion’s notes online and they determine a course of action. 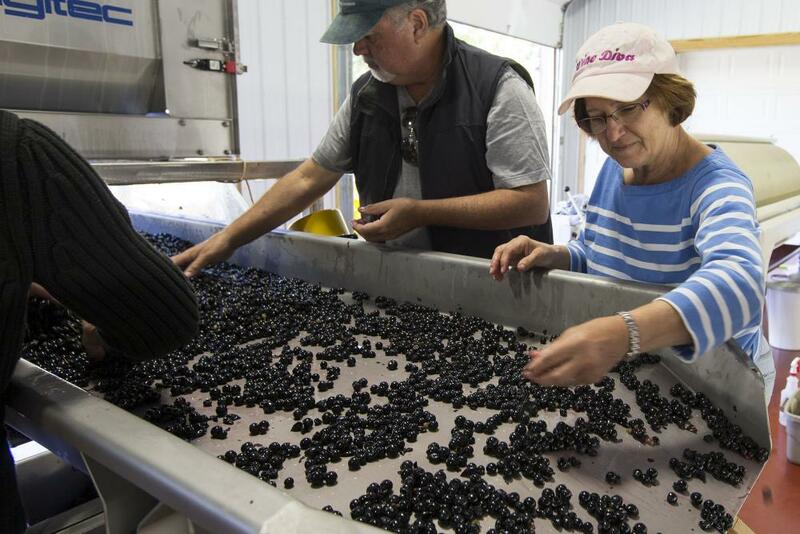 “It’s the hardest thing I’ve ever done – grape growing and winemaking,” Vermillion said. “The struggle is necessary to produce good grapes,” Hughes said. “It’s the art” of it, Vermillion agreed. How is this year’s crop? The two plan to expand their operation to five or six acres this year. They just planted another hill with white Gruner Veltliner grapes from Austria. 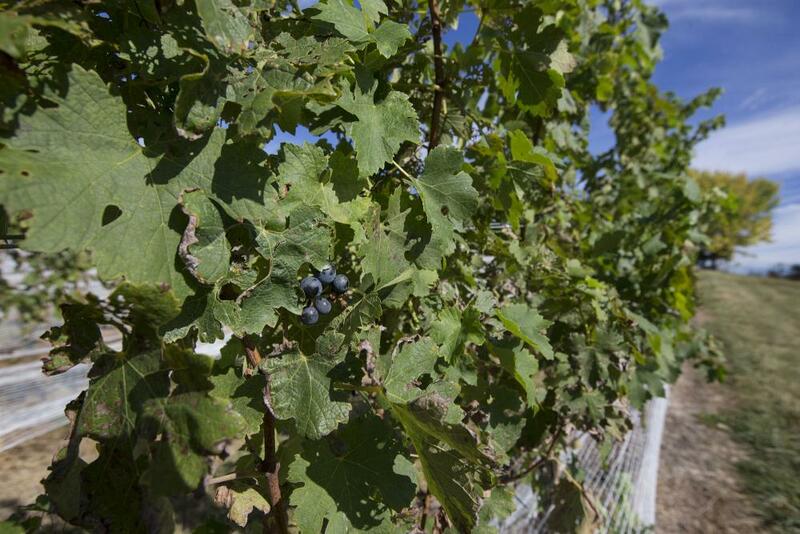 Other varieties they’ve planted include Tannat, a Basque grape from the Pyrenees, Lagrein from the Dolomites – “We have dolomitic soil on our site,” Hughes noted – and Refosco, “another northern Italian grape from the region of David’s grandfather,” Hughes said.